I have good news. 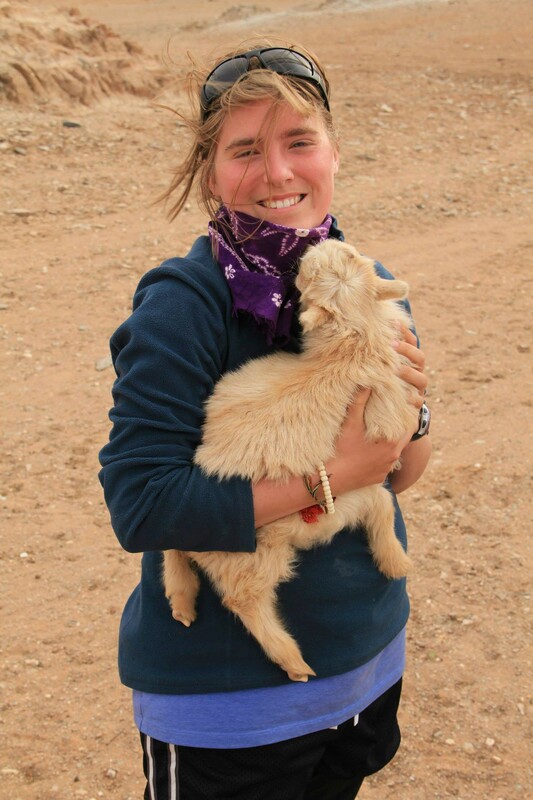 RootsRated has published 11 more articles of mine, all of which you can find at the Minneapolis page. 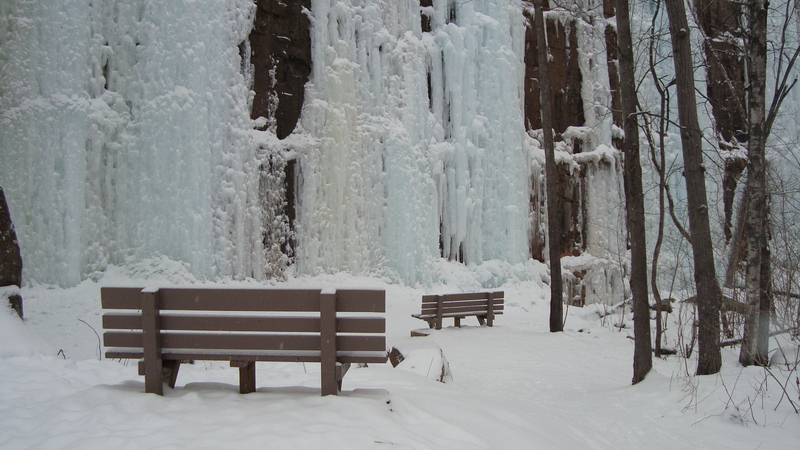 Some of the newer ones include: Perrot State Park, Temperance River State Park, and Vertical Endeavors – MSP. I also got paid to eat food, which you can read about in the Food & Drink section. (I only wrote 4 for the food section). 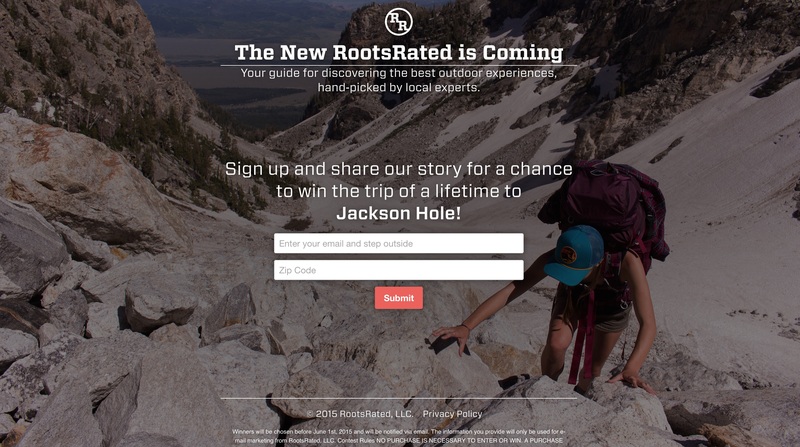 Also, big news for RootsRated. We’re updating the site (in a big way) and there is a giveaway going on for the people who sign up for the new site! If you’re interested, then follow this link. Okay. Now about my action filled weekend! You might’ve not known, but a handful of my co-workers and I went up north. Our boss rented two cabins for us at Tettegouche State Park, so we could enjoy a weekend in the snow. 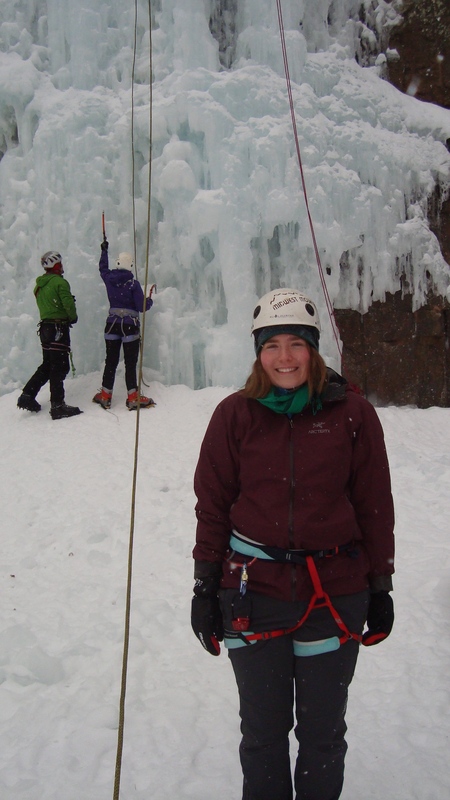 Well, I joined in and then another co-worker of mine brought up the idea of ice climbing at Sandstone, since it’s on the way to Tettegouche. 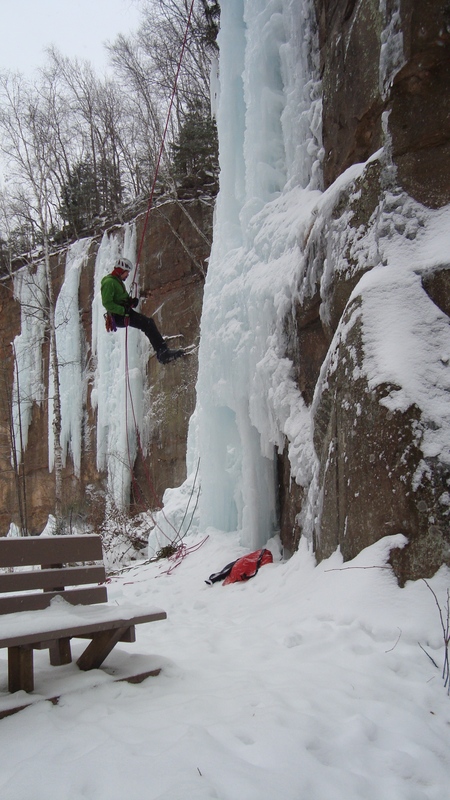 I had always wanted to try ice climbing, so a few people and myself got together and carpooled to Sandstone, MN’s Robinson Quarry Ice Park! On Friday, I woke up bright and early to prep for my weekend getaway. When I looked out the window, I saw it was snowing. It was a beautiful snowfall. It was reassurance that this weekend was going to awesome. I didn’t mention before, but there are specific ice climbing boots you need. You also need crampons for the boots. The best place to get them is through the UoM’s Center for Outdoor Adventure (COA). It’s the cheapest option and you don’t have to be a student to use them! It’s a bit funny to get there, so I’d recommend calling in advance for directions. Also, call in advance to reserve equipment. 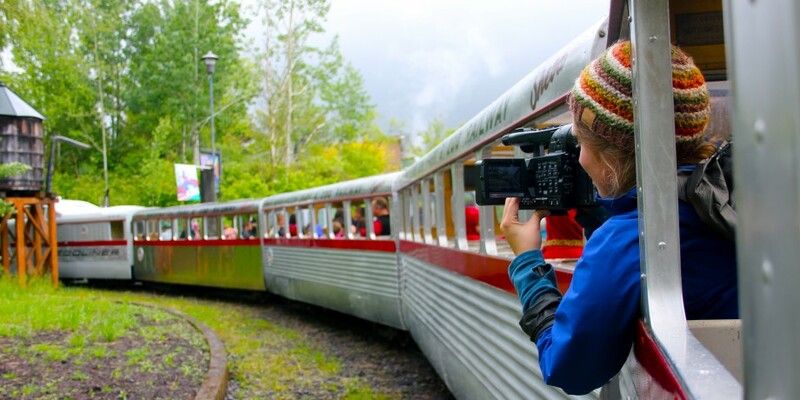 Sometimes items reserve up quickly (even ice climbing boots and crampons!). So, my car buddy (Kyra) and I had never ice climbed before, so while driving up to Sandstone, we were excited and anxious at the same time. When we turned into the Robinson Quarry Ice Park, we didn’t really have any idea where to go, so we followed these lone car tracks. In the end, they were our co-worker’s car, which was great because we found our way to the climbing walls. (For those who are curious. When you turn into the Robinson Quarry, follow the road down the hill. Take a slight left onto a small road. Follow it until you reach a fork (a loop). Take a left and park at the picnic tables. You’ll see the ice covered walls). When we parked our car, Kyra and I gawked at the steep ice walls. They were magnificent. We realized we were alone, but knew that our friends were nearby because their car was there. We soon realized that they were walking along the upper ledge of the ice walls because they were setting up the anchors for the two routes we would climb for the day. Kyra tugging on the rope. Making sure the anchor is set. 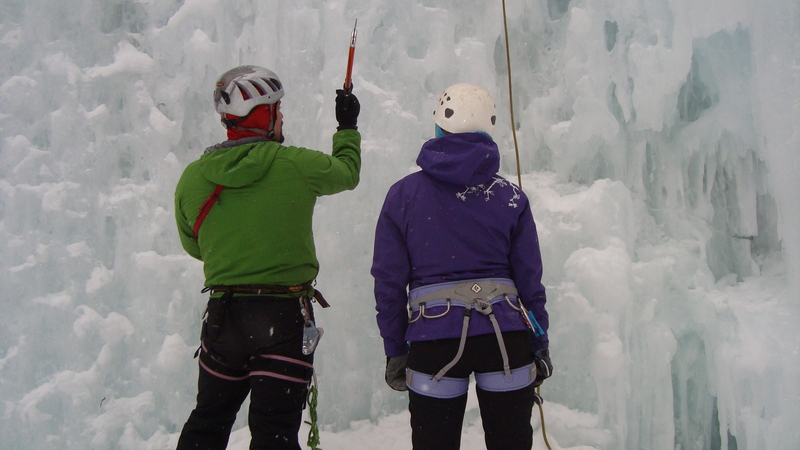 When all was set, our ice climbing guru, Phil, gave us new climbers some pointers. He showed us what ice axes we’d be using and how to use them. He also mentioned about the footwork necessary to get up the wall. 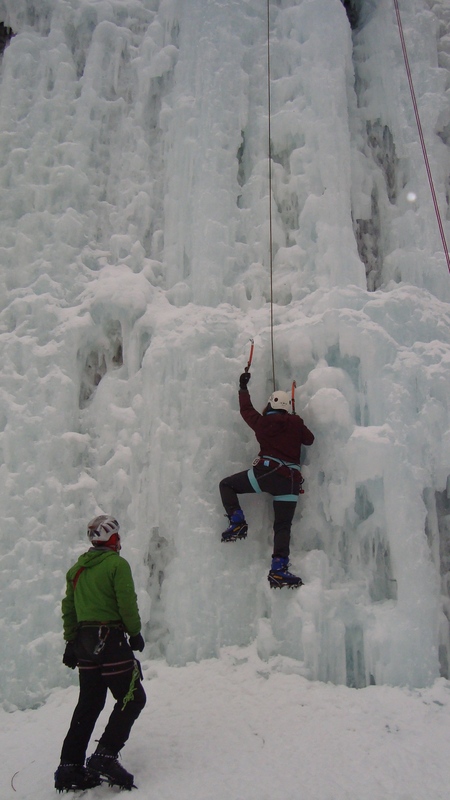 It’s very similar to rock climbing technique, but since your arms are extended by sharp ice axes, it changes the way you hold yourself while climbing up the wall. What Phil told us is to keep your arms straight as much as possible. Meaning, let your skeleton take the brunt of the weight, not your muscles. It’s easier said than done, that’s for sure! He also mentioned some terminology. “Hooking it” means you don’t pierce the ice, you only hook into a previous made hole or cranny. “Sticking it” means you pierce your axe into the ice, so to hold you up. It’s more efficient to hook than to stick, which I learned quite quickly. My feet were pretty cold (make sure to layer up in socks people! ), so I let Sonia and Kyra climb first. I watched their first ascents and was impressed by how quickly they got up. 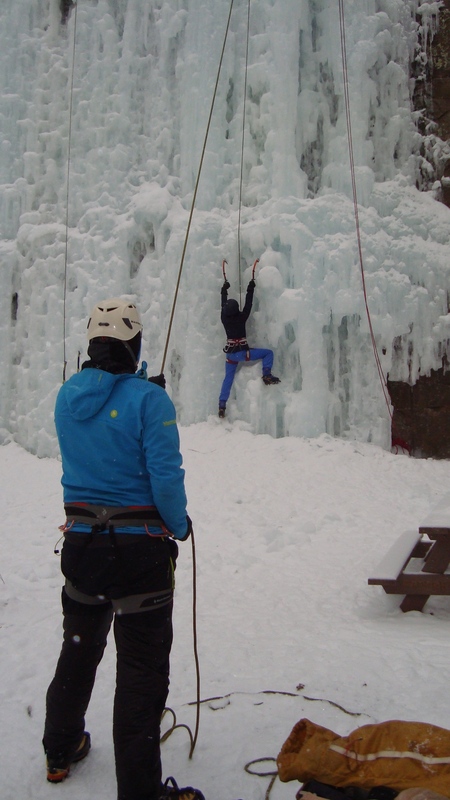 Phil also tackled a route and made ice climbing look real easy. It was good to watch him because I recognized some of the technique that I would need to use. Ian is belaying Sonia’s first ascent. She nailed it! I’m ready to go. Here’s me nervous, but mostly excited! Soon enough, it was my turn to try it out. I put on my harness and tied myself in. Phil came over and reminded me to focus on straight arms and good footwork. I told him I would do my best. When I had the axes in my hands, I was surprised how light they were. It made me realize how nice it is to have outdoorsy friends who actually buy high-end carbon fiber ice axes! I took a few breaths and looked up the ice wall. I got my first hook-in and started my first ascent up the ice. I wish I could tell you that I nailed my first climb, but I totally only made it a short way up. If I remember correctly, my footing slipped. For anyone who has climbed before (rock climbing, I mean), would know that feeling that I felt while on that wall. Though I’ve been climbing for on-and-off 4-5 years, that first ascent reminded me of the first time I ever rock climbed. My mind went blank, almost like I had never climbed before. I forgot everything I had ever learned, all because I let the ice get the best of me. On my next try, I told myself I would make much better footwork and hooking-in decisions. My second ascent went much better! On my second try, I did much better. My footwork was sound and I made it up the wall pretty quickly. I totally got the hang of it. The only thing I was missing was my gripping muscles. I hadn’t climbed in a couple months (due to my foot injury), so my climbing muscles were nothing. Which means, my arms got pretty tired! I tried my best to take breaks and regain my strength (and to not get the “Screaming Barfies,” which is when you keep your arms above your head for too long that when the blood rushes back to your arms, it hurts like hell! Causing one to scream in pain and then barf shortly after). Luckily, it wasn’t cold enough and I wasn’t good enough to get the screaming barfies, but my arms sure did get sore. Here’s me taking a break. I didn’t make it much further, but I was sure proud of myself anyway! By the end of my second ascent, I was really happy with how it went. I made it up past halfway, all thanks to 2 ice axes and 2 crampons. 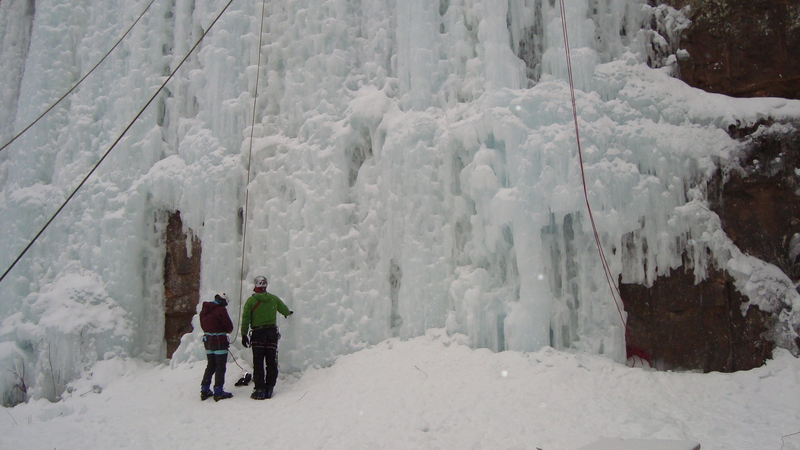 It’s empowering to know that I’m able to climb a wall of ice. I’m thankful for my friends for inviting me to join and to teach me how fun this winter sport is! Just another fun activity to put on my Minneapolis Winter List. 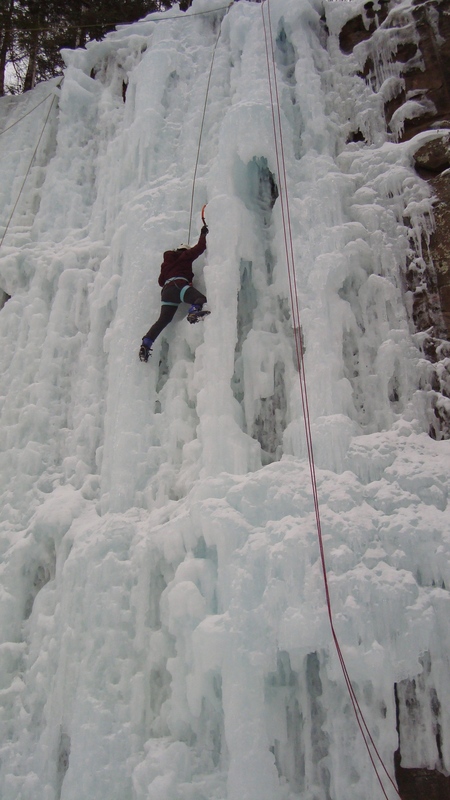 I look forward to ice climbing again, when my foot is fully healed, so that I can actually finish a whole route! Well, I’ll end here, but in my next post, I’ll tell you all about backpacking to Tettegouche State Park’s Historic Camp and skiing on the picturesque Mic Mac Lake. P.S. I bumped into an old friend of mine named Andy. He is apart of a band called The Paper Days and they just released a super cool music video. Even City Pages recommended it. Check it out! Dear Molly, you’re becoming quite the writer! 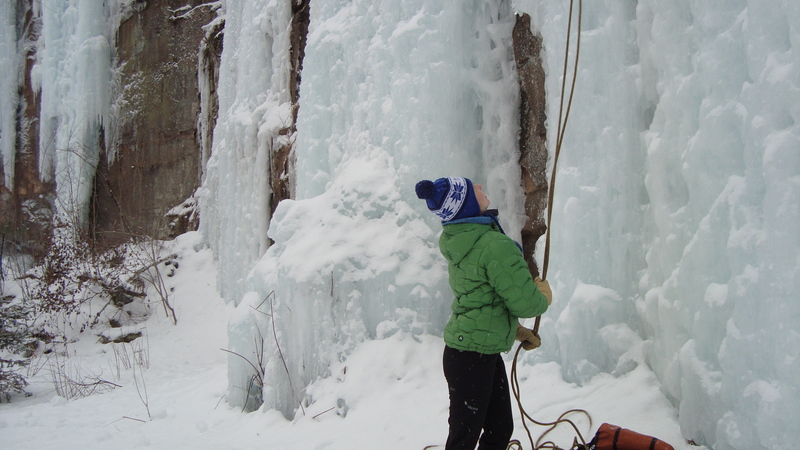 A beautifully told story of (shudder) ice climbing. You brought it to emotional life. Love reading your blog!